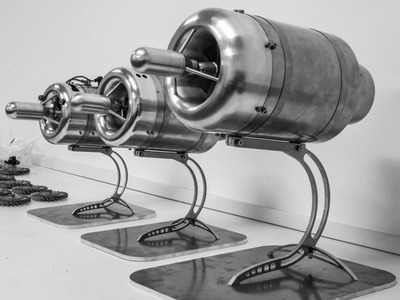 Cape Aerospace Technologies (CAT) is receiving new orders for its locally developed range of small gas turbine engines, which are used for target drone drones, unmanned aerial vehicles, gliders and model aircraft. CAT has three main models: the CAT 120 produces 125 N of thrust at 125 000 rpm and weighs just 1.4 kg while the CAT 250 produces 250 N of thrust and weighs 2.1 kg. The largest is the CAT 400, which develops 400 N (40 kg) of thrust and weighs just 3.6 kg. All can operate between -25 and 50 degrees Celsius and at altitudes of up to 8 000 metres. They are intended for sub-sonic applications. The turbines can operate on Diesel, Kerosene or Jet A1 fuel. All turbines include an Electronic Control Unit (ECU), Ground Support Unit (GSU) and all ancillaries required for engine operation during flight. CAT turbines are produced with a fuel atomizing direct kero-start system, making turbine starts fast and reliable. The atomizer system also enables a relighting capability for high altitude starts. David Krige, MD/CEO of CAT, told defenceWeb that the CAT 120 has been in production for a number of years and the CAT 250 has just received orders and is going into production. On the CAT 400, he said there has been a lot of demand, especially as a sustainer jet for sailplanes. CAT has done most of its business locally, but has exported numerous gas turbines, mostly for hobby/scale model aircraft. Aside from typical applications like target drones and scale model aircraft, Krige said there is big demand for using the gas turbines as power generators as they have high power to weight ratios and can run on a variety of fuels. Krige said he would like to develop other gas turbines and is contemplating the 1 000-1 500 N thrust market. CAT works with the CSIR and the University of Stellenbosch on micro to small gas turbine technology and also receives support from the Aerospace Industry Support Initiative (AISI).